It's a bit off the tourist trail these days, but Wat Suthat is still a very important temple to the Thais. This area is the home of the Brahmin priests who oversee royal rituals such as the ploughing ceremony held at the traditional beginning of the growing season. 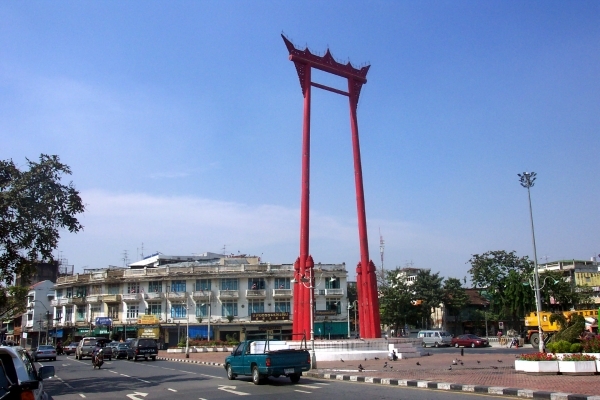 In front of the temple is the huge Chinese-red frame of the giant swing. The swing was the center of an annual ceremony where teams of young men would try to swing high enough to retrieve a sack of gold tied to a pole about 75 feet (25 meters) in the air. So many men died in the attempt that the ceremony was banned in the 1930s. The swing was recently restored and was re-dedicated by the king in September 2007. Wat Suthat was built in the early nineteenth century to house the huge 25-foot tall Phra Sri Sakyamuni Buddha statue, which was bought all the way from Sukhothai by boat. The Wiharn housing the Buddha image sits in a large cloister. The outer wall of the cloister is lined with more than 150 Buddha images. 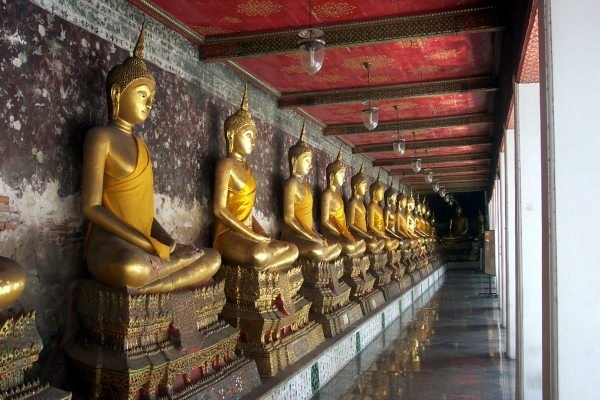 The statues are in various states of repair, since each is "adopted" by a patron to make merit for a departed loved one, who may in fact be interred in the base or the wall next to the Buddha. In late 2007, there was a project under way to re-gild each of the statues. Be sure to have a look at the doors to the cloister in the middle of each of the four walls. They are painted and gilded with quite colorful scenes from the Ramakien. The courtyard between the Buddha gallery and the wiharn is full of Chinese statues reported to have been shipped from China as ballast in rice boats during the reign of Bangkok's first king. The wiharn is one of Bangkok's tallest due to the need to house the huge Buddha statue. The walls are painted with murals depicting the last 24 lives of Buddha. The columns are also painted with murals showing the early life of Bangkok. Check out the column nearest the door on the right. It depicts scenes of the early westerners who came to Siam. On a large median in the road running next to Wat Suthat is a small Vishnu shrine, while a short way up Dinso Road is a larger shrine dedicated to the whole Hindu trinity. Wish you could have this information with you when you visit Wat Suthat? Now you can. Check out our downloadable eGuides. Wat Suthat is not far from the Golden Mount and Loha Prasat in Wat Ratchanada. 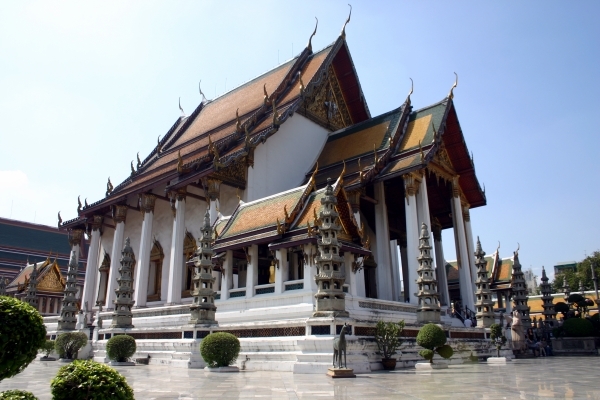 See our walking tour which takes in all of these temples and the sights around them. Visitors must pay an entrance fee of 20 Baht (0.52 USD) at the booth just inside the north gate. The temple is open 8:30 am to 9:00 pm.